Fahd Al-Rasheed is the Group CEO and Managing Director of Emaar the Economic City (EEC), a publicly listed company leading the development of one of the largest private sector projects in the world, King Abdullah Economic City (KAEC). KAEC is a next-generation city on the Red Sea coast of the Kingdom of Saudi Arabia, with a planned population capacity of two million people and a total investment of over USD 100 billion. Under Al-Rasheed’s leadership, KAEC developed the first private deep-water container port in the region and attracted more than 120 leading global and regional companies to establish operations in the city, making KAEC the fastest growing logistics and manufacturing hub in the Middle East. In addition, Al-Rasheed is spearheading the development of a significant number of residential and leisure projects that will transform KAEC into one of the leading tourism destinations in the region. Al-Rasheed is the Founding Chairman of the non-profit Red Sea Foundation, a Geneva-based NGO think-tank established in 2016 to support the development of the Red Sea region, which is the largest, fastest growing emerging market in the world (750 million people today growing to 1 Billion by 2030). Al-Rasheed is also the Vice Chairman of the Board of Trustees of Prince Mohamed Bin Salman College of Business and Entrepreneurship, Saudi Arabia’s first world-class business educational institution to focus on entrepreneurship and leadership. The College is developed in partnership with the Mohammad bin Salman bin Abdulaziz Foundation, Babson Global and Lockheed Martin. Prior to joining EEC, Al-Rasheed held the post of CFO and Deputy Governor of the Saudi Arabian General Investment Authority (SAGIA). Previous to his work in SAGIA, Al-Rasheed led strategic initiatives in investments and corporate finance for Saudi Aramco. Al-Rasheed serves on the boards of several organizations including EEC, King Abdullah Port, Harvard Kennedy School Dean’s Council, Petromin, Saudi Airlines Catering Company, the New Cities Foundation, and the Foundation Board of the Global Shapers of the World Economic Forum. 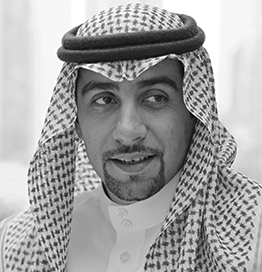 Al-Rasheed was honored as a Young Global Leader by the World Economic Forum in 2011.